For nearly 80 years the family of Conrad Salge lived on the 160 acres he purchased from the government in 1847. The location was prime. 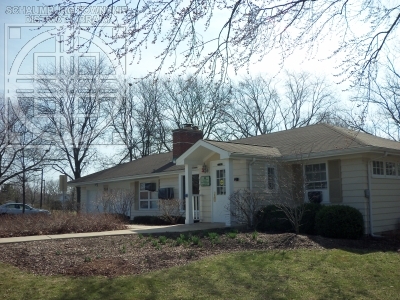 It was on East Schaumburg Road across from St. Peter Lutheran Church where Mr. Salge was a charter member. It was gently rolling and ripe for the developer who bought it from the Salges. Prime location indeed. In the later years of the roaring twenties, the property was sold to a group called the Deauville Country Club. In fact, in a January 21, 1927 article in the Daily Herald, it is stated, “Mr. Lengl and Mr. Jensen took a little exercise and walked to the Deauville club house Sunday and enjoyed it through the deep snow, but it is good for the health.” By July 17, of the same year, the golf course had opened as the Meadowbrook Country Club. On a 1930 map of Schaumburg Township found on the website of the University of Chicago’s library, Meadowbrook Golf Club is still shown on Schaumburg Road. But, not for much longer. With the full onslaught of the Depression hitting the area, Meadowbrook was forced to close. It is not known if the property went into foreclosure or whose hands it was in through the remainder of the 1930s. We do know from Wayne Nebel’s oral history that his family lived in the clubhouse for a year or two during this time when he was a young boy. One presumes they moved into a beautiful new clubhouse that had been built by the original Deauville owners. Instead, those owners remodeled the farm house into a club house. Not only does the Chicago Tribune article from above confirm that fact but a 1959 article from one of the local papers mentions that Walter and Helen Slingerland purchased the 160 acres in 1941 and “the house which was built around 100 years ago, was remodeled soon after they bought the property.” According to Mr. Nebel, the Slingerlands also converted the golf course back to its agricultural roots and began farming the property themselves. They later turned this job over to Melvin Jensen who leased the property for farming. 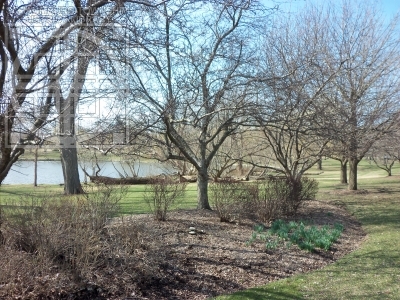 They eventually sold most of the acreage to William Lambert around 1973 who donated 40 acres to the village of Schaumburg for their municipal center. 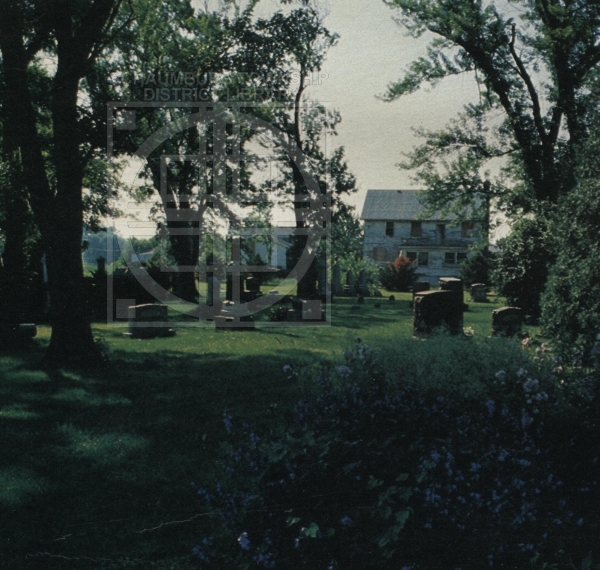 It was arranged to have the farmhouse moved across the street to the St. Peter Lutheran Church property in 1974 or 75. 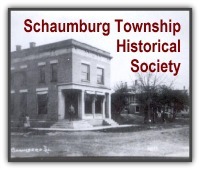 The house still exists today, making it one of the oldest structures in Schaumburg Township. You can see it here in 1978 in the background of the photo. The siding is obviously in disrepair. Another wider siding that was a yellowish gold in color was placed over it some time in the early 1980s and remained in place until September 2012 when it was replaced with a thinner, gray hued siding. According to Don Busche of St. Peter’s, the original siding still remains though it is wrapped in Tyvek. The elder Slingerlands gave a small parcel along Schaumburg Road to their son, Walter, and his wife, Helen, who built a ranch house on the property in 1951, the year they married. (See above photo.) They continued to live in the ranch until the early 1990s. Through an agreement reached in 1989, the village purchased the house on its one acre in exchange for the Slingerlands living there until 1994 paying $1 in rent each year. The ranch house is still used to this day as the Nursing office of the village. And the land itself? Looking at the beautiful grounds of the village, it’s not difficult to see how those investors thought it would make a perfect golf course. I talked to many people in the process of writing this posting. The list varies from Mayor Larson to Mr. Busche, the caretaker of the St. Peter property, to relatives of the Slingerlands to some of the longtime residents of the area. All were most helpful to me in getting the full story and I appreciate their assistance. 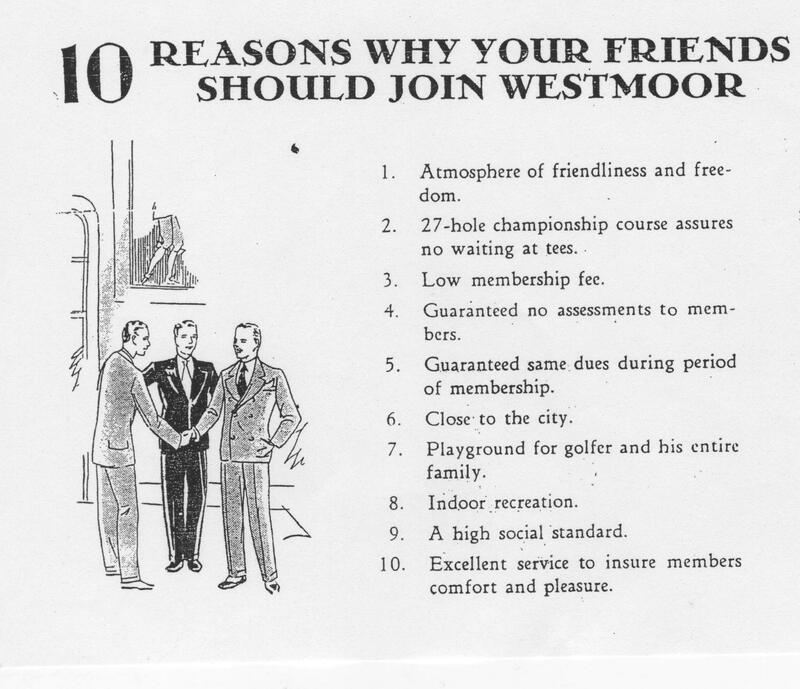 Before the Schaumburg Golf Club and the Golden Acres Country Club and the Roselle Country Club, there was the Westmoor Country Club. It came about when Frank Sporleder sold his rolling farm land on Roselle Road in 1926 to a group of Jewish investors who built a beautiful golf course on the property and named it the Westmoor Country Club. The country club opened the first nine of its 27 holes on May 29, 1927. A couple of months later the clubhouse was dedicated with speeches given by Judge Harry Fisher, Rabbi Samuel Schwartz and others. Dancing followed. The manager of Westmoor was Charles L. Barkoff who had served as catering manager of the Cooper-Carlton in Chicago for many years. Because of his connections, the cuisine at Westmoor was known to be quite good. Sam Geyer initially served the club as the golf pro with Scotty Irwin later taking this post. To attract golfers, the board, under the guidance of Max J. Langhaus, decided to make the course a destination for families as well. They put an outside playground in place, complete with swings, slides and large sandpiles and a playhouse for rainy days. This allowed mothers to shoot their own rounds of golf or participate in luncheons, bridge parties and other social events held at the club. In 1929 the club was added on to with a write-up on the renovation appearing in the February 1930 issue of Slices and Hooks. A new colonial entrance gateway was built and the 8-sided foyer inside the clubhouse gave entrance to the lounge, dining room, main porch, locker room, check room and office. The dining room was built like an open terrace and a Men’s grille was added as well. It was also mentioned that “the grille has toilet facilities, phone booths, etc. so that a man does not have to leave the grille in order to get any type of service.” The locker room was expanded by 70% and was now large enough to accomodate 504 men with services provided by valets, a barber and masseuse. Not only was golf a mainstay, but the country club was also designed to hold special dinner dances, holiday parties, prize fights and other events. In fact, in a June 10, 1937 issue of The Garfieldian, it mentions a golf party, dinner and boxing show taking place on Thursday, June 17. It is unknown when the Westmoor Country Club was sold but a Daily Herald article mentions the Roselle Country Club in 1941. It was still called the Westmoor in a June 1938 accounting of a small fire at the club so it is presumed the sale happened somewhere in between. Wayne Nebel stated in his oral history that the club was sold around 1941 and the membership moved to the Twin Orchard Country Club in Chicago that then bordered Bryn Mawr Avenue and Wolf Road. 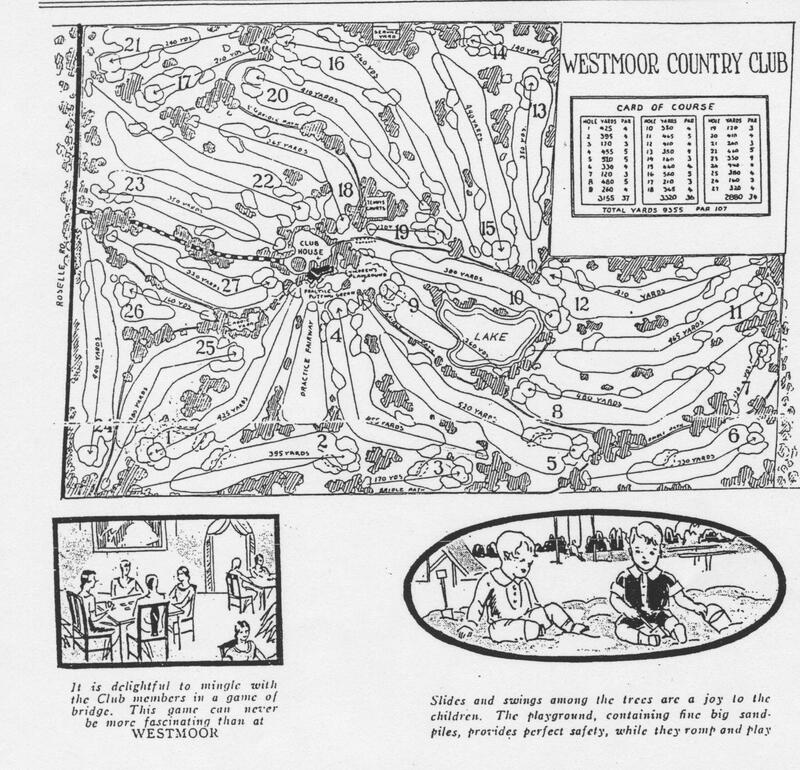 To confuse matters a bit more though, a July 24, 1949 issue of the Chicago Tribune makes mention of the course being forced to close during World War II “in about 1943.” It is unclear if the Westmoor owners had control of the course at that time. In notes from the Schaumburg Township Historical Society, it is mentioned that the club was sold in 1943 to George Matthies “who stripped all the sod from it and sold in 1944.” In an 8/10/1961 article from The Herald, it also mentions that “the owners sold sod and top soil from the land.” After doing much research for a George Matthies using census, newspaper archives and websites, I can find no mention of a gentleman by that name. I did find a Chicago Tribune article from June 1, 1947, that states that a William Matthies bought the property in 1946. It is mentioned that the property sat “idle during the war.” Previously it had been operated as a private club and in an ad in The Herald from July 19, 1946, it says “formerly a private club now opened to the public…” This must have been after Matthies bought the property. According to Mr. Nebel, the Matthies owner was supposed to have owned Bloomingdale Nursery–which maybe explains the stripping of the sod. Matthies sold the property to “Thomas Hogan and A.C. Stewart who with their wives are the owners of the club corporation’s stock…Stewart said he and Hogan bought the course for $100,000 in July, 1948.” [Chicago Tribune, July 24, 1949] A Herald article from August 5, 1949 recognizes them as Thomas B. Hogan and Archibald C. Stewart Jr. It is interesting to note that the only Thomas B. Hogan that I can track down became president of the Yellow Cab Company of Chicago in 1932. Was this the same man? And how was he connected to Archibald Stewart? It is presumed they were business acquaintances and/or friends. The next record of the property being sold was in an article from the March 17, 1956 issue of the Chicago Tribune. It states that “LaSalle National Bank as trustee has purchased the 206 acre Roselle Country Club, on Roselle Rd. just south of Higgins Rd., from Roselle Country Club corporation for an indicated $332,500.” A January 26, 1957 issue of Realty & Building states that in March of 1956, “$350,000 was paid for Roselle Country Club, 27-hole, 200-acre golf course… Dimensions of the tract are 2640 x 3960 ft. The property was purchased by James Guerino, Louis DeLuca and Michael Laterza from Roselle Golf Club, Inc., according to the deed filed with the recorder in March.” Obviously LaSalle National Bank was acting as a trustee for the three gentlemen. They, however, did not hold onto the property for long. A March 9, 1961 article from The Herald states that George M. Sloan acquired the property in February of the same year from a three man ownership team of the gentlemen mentioned above. Thus began a long period of stability for the golf course. Mr. Sloan promptly began a facelift of the property and also renamed it the Golden Acres Country Club. Allan Griffith of Hoffman Estates was hired as the new club manager. It remained in his hands until he passed it on to Phyllis and Curt Kotel, his daughter and son-in-law. The Sloan/Kotel families maintained the property for 27 years. It was eventually acquired by the Schaumburg Park District in 1989 from the Kotels and renamed the Schaumburg Golf Club as it exists today.